Peter MacKinnon hasn’t been on Dalhousie University campus for long, but controversy is already stirring. On Jan. 21, Dalhousie’s new interim president arrived at the Arts Centre, for his Studley campus welcome event. 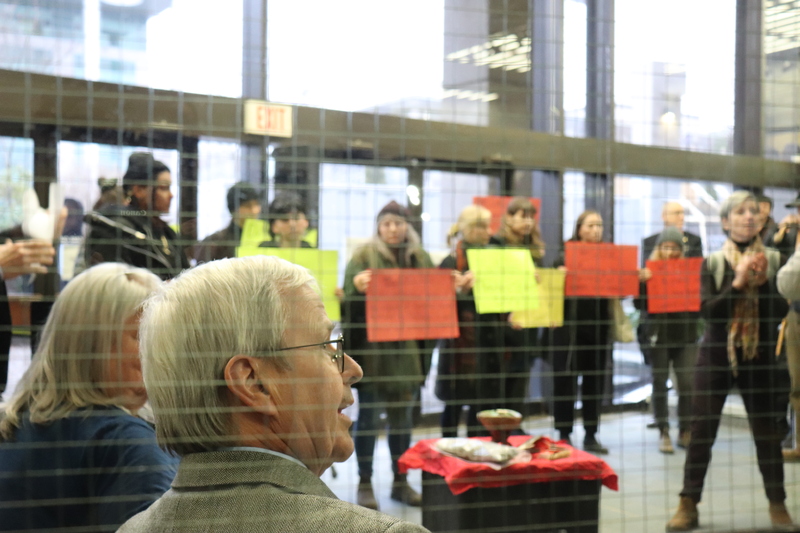 A group of silent protesters was waiting for him with a list of demands for the school, the first being MacKinnon’s immediate removal. Along with Lianne Xiao, president of the King’s Student Union, Wright published the press release outlining the reasoning and demands of the protesters. Students are also concerned with MacKinnon’s implication that blackface on Halloween is an issue of freedom of expression, writing that “these were Halloween parties … so describing them [as racism/bigotry] risks diminishing real problems of intolerance.” Additionally, MacKinnon critiques Dalhousie’s handling of the 2015 Dentistry scandal. The full page of quotes pulled from MacKinnon’s book can be viewed here. Freedom of expression is also an “indispensable condition” of the university “commons.” I define this as the space for the debate, discussion and collaboration that are both inherent in, and essential to, the idea of the university. This commons has been tested so often in recent years that it is not hyperbole to describe it as a contemporary battleground over its boundaries. – Excerpt from article written by MacKinnon, titled ‘Freedom of expression is under attack at our universities’ published by The Conversation. 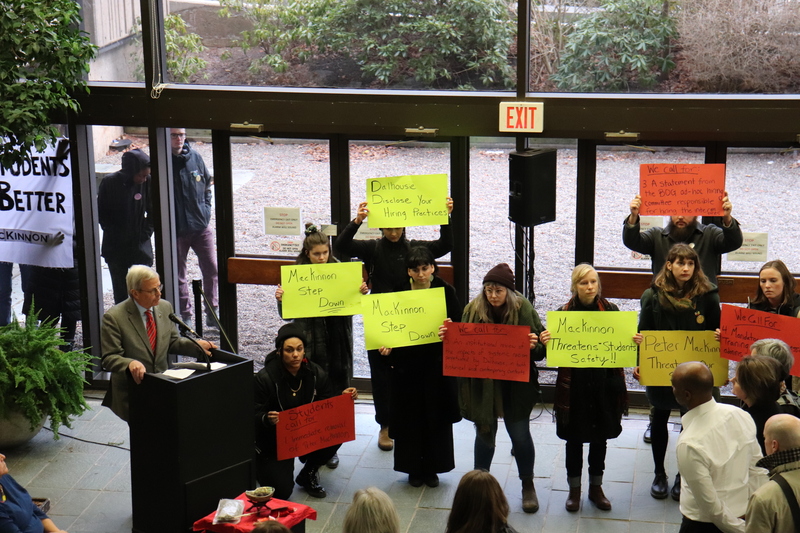 The protesters waited until the smudge, prayer and event introduction was over before beginning their silent protest: holding bristol board signs with their demands on them, as well as comments against MacKinnon’s problematic views and the University’s lack of transparency in appointing him. MacKinnon speaks while the student protesters silently hold their signs. 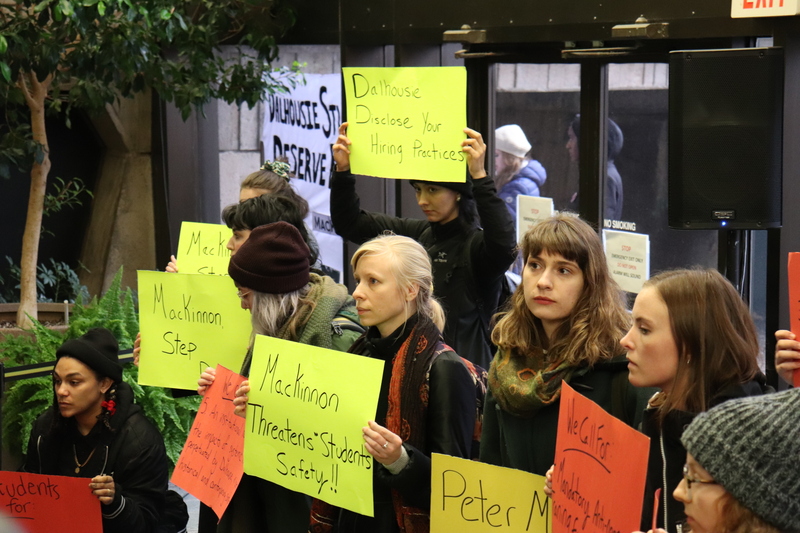 “Students call for the immediate removal of Peter MacKinnon,” reads one. On the signs read their protests of the interim president, their problems with him and demands for the university. “MacKinnon Step Down,” Dalhousie Disclose your Hiring Practices” and “MacKinnon Threatens Students Safety! !” read some of the signs. Protesters stood with their signs inside and outside the building during MacKinnon’s speech. 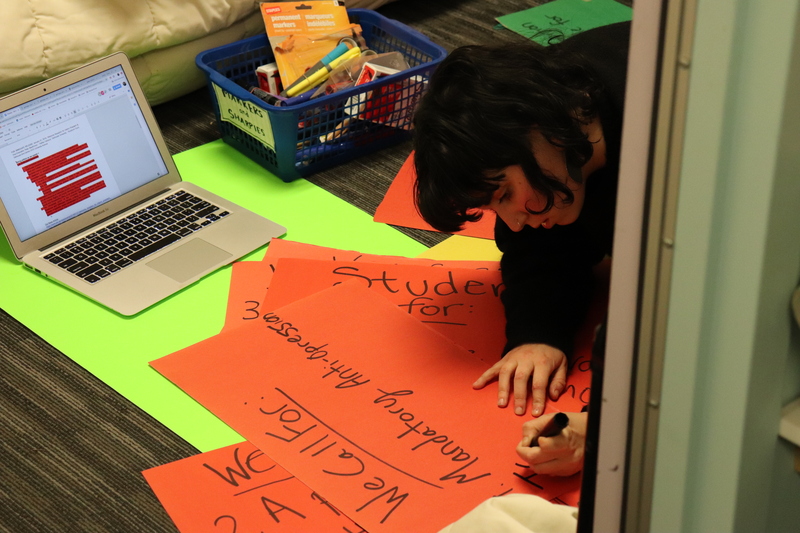 University of Kings College student, Pheobe Lamb, makes signs at the NSPPIRG office before the protest. 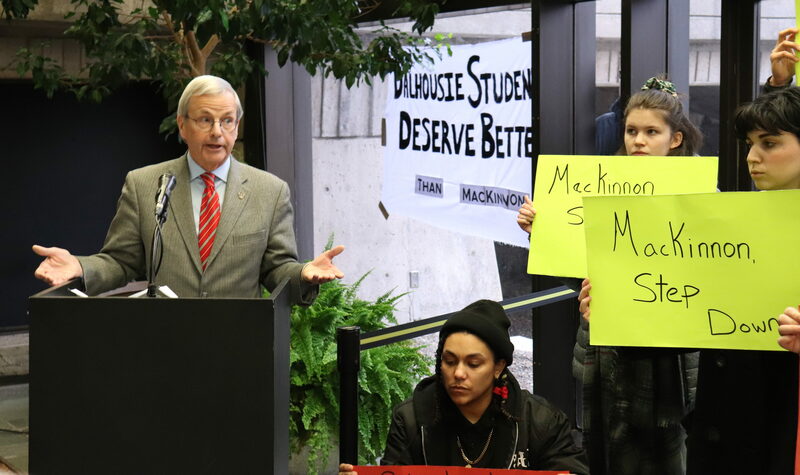 MacKinnon gives his speech at the Jan. 21 Studley campus welcome reception while students stang alongside him, protesting his interim presidency at Dalhousie University. Once MacKinnon finished speaking, the protestors milled about, and Dal student Kati George-Jim read their demands aloud. 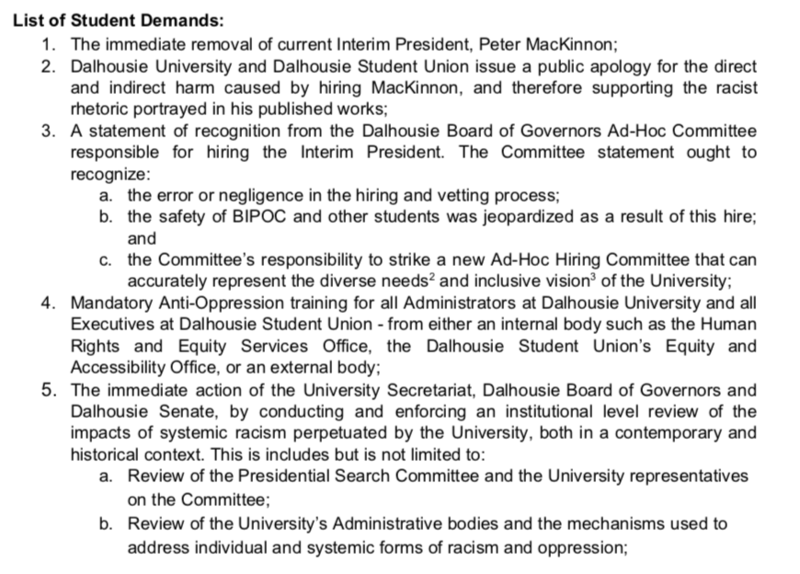 List of demands included in a press release, Jan. 28, from students protesting the hiring of Dal University’s Interim President, Peter MacKinnon. 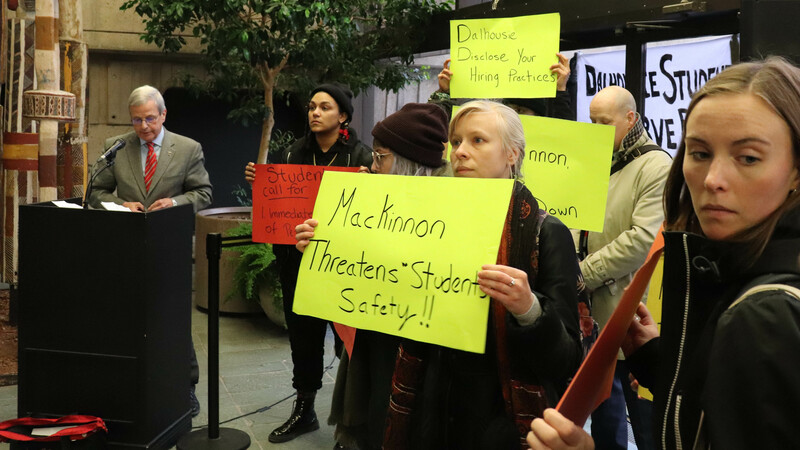 “Peter MacKinnon, as Interim President, is a concern of safety for Black, Indigenous, and students of colour across our campuses,” reads the release from the student protesters. To view it in full, click here. According to Wright, the protesters haven’t heard much from the school in response to these demands. Many of the issues I wrote about are contemporary and contentious. Some are discussed in depth; others are mentioned for limited illustrative purposes. I wrote about them for purposes of discussion. I welcome that discussion, and I appreciate the perspectives that have already been shared with me. The book is about many subjects: university governance, crisis management, academic freedom, freedom of expression, religious freedom and discrimination, and other topics. While I stand by my discussion on these topics, I wish to comment on one matter that has raised concern. I have been interpreted by some as condoning blackface. I do not condone blackface; and I did not condone blackface in the book. I regret any interpretation to the contrary, and the distress it has caused. At the Dal Student Union council meeting on Jan. 30, DSU Vice-President (Academic and External) Masuma Khan briefly addressed the MacKinnon debacle. While Wright and Xiao plan to host an open forum later this year to allow students to share their experiences and engage with MacKinnon, who has accepted their invitation to attend, they remain steadfast in pursuit of their main demand. “Students deserve a safe campus, and BIPOC students, queer and trans students and student survivors all deserve a safe campus. We’re really the heart of this institution and we’re the ones being affected by decision makers,” said Wright.